Cooper City Movers – Sometimes it’s better to just leave it to the pros. Moving is definitely one of those things. Here at Discount South Florida Movers we are committed to saving you time and energy and providing you with service you will feel good about. With over fifteen years of service in and around the area, we guarantee you will be satisfied with your move. We can provide you with piece of mind that your belongings are safe securely packing and shipping them. We even handle pianos, artwork, and antiques. If your final location isn’t ready yet we also offer storage for all your belongings. Come request a free quote today and see why our rates can’t be beat in South Florida. Cooper City is located in the middle of Broward County. Founded and incorporated in 1959 by Morris Cooper, this city of 29,000 has recently undergone a new wave of home construction. The new construction is located in mainly in Waldrep Dairy Farm which was annexed in 2006 which added over 500 hundred thousand acres to the city. The city was chosen as one of the 10 best cities for families in Family Circle magazine. In addition, the city’s water department received recognition by the National Journal of the American Water Works Association for their efforts in spreading information about water conservation. Fortunately, all the new construction will allow more people to live in this award winning, family oriented city. 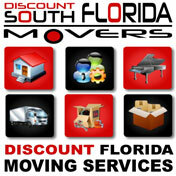 Discount South Florida and Cooper City movers provide low rates on residential, commercial, piano and long distance moving.